The AeroSpreader™ S80 is our smallest mobile dry pellet fish feeder. 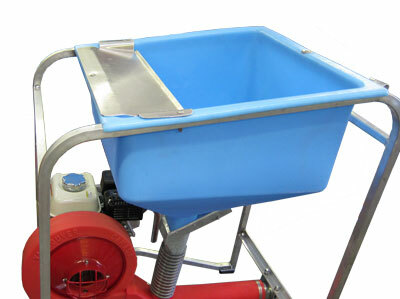 With an empty weight of just 50 kilograms (110 lbs), this fish feed broadcaster’s compact size is designed for easy loading into a float-plane boat, or truck for quick transport and can be immediately deployed on any flat surface. Designed as a self-contained feed pellet broadcast blower, the AeroSpreader™ S80 is a single operator controlled unit with both blower speed and feed rate control levers conveniently located above the handheld flexible feed broadcast hose assembly. 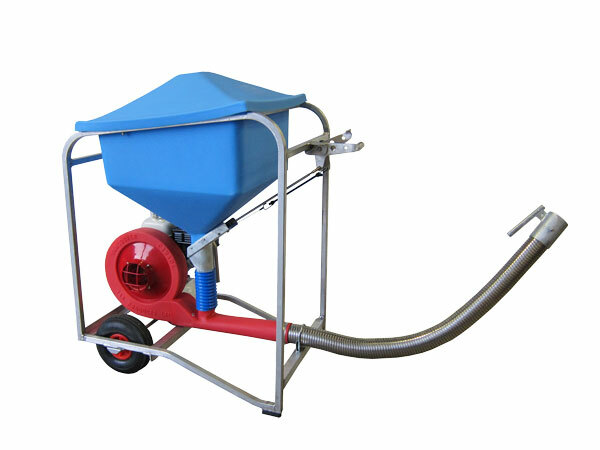 The fish feeder’s narrow operating platform and easy rolling pneumatic wheels make the AeroSpreader™ S80 ideal for small fish farm or shrimp farm site operations where large quantities of feed need to be continually distributed evenly across the surface. Traditional hand-feeding methods result in operator elbow and shoulder strain, with a physical limitation in the quantity of feed that can be handled, and a compromise in feed pellet distribution and coverage. 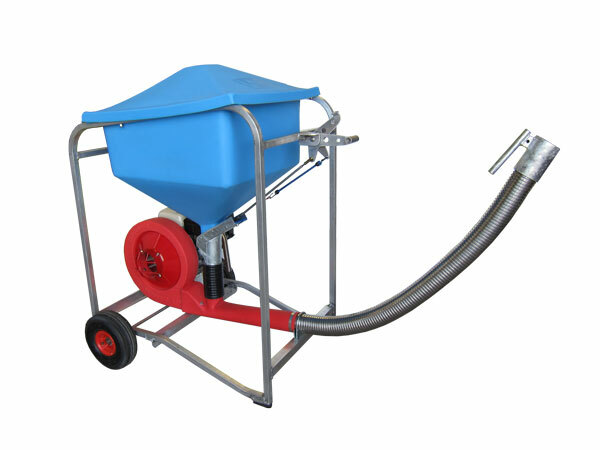 The AeroSpreader™ S80 addresses these performance issues with the use of a reliable 4 hp Honda® motor direct driving an Aerite™ AB120 model fish feed blower providing the energy necessary to continually broadcast large volumes of feed pellets from crushed to 9.0 mm through a 3-inch diameter stainless steel flex hose. A flexible handheld broadcast hose offers full operator feed control of feed pellet placement as needed to maximize feed pellet coverage while minimizing fish feed competition and ensuring maximum growth. All feeder edges and faces are hand smooth with no sharp edges to injure operators. A direct drive Aerite™ AB120 model blower requires no belt/pulley adjustments. One-piece cast aluminum impeller lowers operating and service costs. Matched air inlet and impeller design reduces fuel-operating costs while delivering high scfm air delivery rates at lowest possible sound levels. A self-contained power pack fitted to a compact sized, light weight pneumatic wheeled feeder ensures quick set up and operation practically anywhere. 16 kg maximum (35 lb) per minute for 9 mm feed pellets. Note that feed delivery rates increase as feed pellet size decrease. UV stabilized polyethylene hopper. Galvanized steel, aluminum and stainless steel hardware. 3 Kw (4 HP) gasoline powered Honda® motor with low oil alert.